Nara has some truly spectacular annual festivals and events. Here’s my rundown of the main Nara festivals and events which are definitely worth seeing if you can. Nara has some of Japan’s most impressive festivals and events. 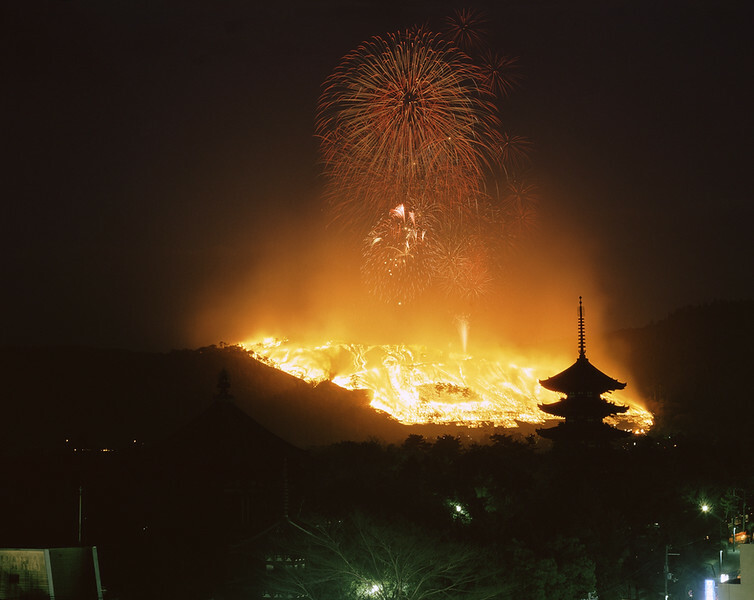 Many are evening fire festivals, making them some of the most photogenic and dramatic events of the Japanese calendar. This page lists five of Nara’s biggest events. Keep in mind that this is only a start: There are plenty of other events, special openings, museum exhibitions and other happenings going on throughout the year; ask at the various tourist offices to find out what’s on while you are in town. Held on the fourth Saturday of January (24 January in 2015), or the following day in the event of bad weather, this is Nara’s most spectacular festival. At around 5.30pm, a fire is lit in the middle of Wakakusa-yama, the mountain that rises over the east side of Nara. At 6pm, a fireworks show is held and then, at around 6.15pm, the dry grass on the hillside is set alight and the entire mountainside burns brightly. You’ll have to arrive very early to grab a spot at the base of the hill, but you can see it from many parts of Nara-koen Park and even Downtown Nara. Held twice annually, on the evenings of 3 February and 14-15 August, between 6.30pm and 9pm, this festival is a feast for the eyes. About 3,000 lanterns are placed around Kasuga-Taisha Shrine and along the pathways leading to the shrine. The effect is magical – if you’re in town on these dates, don’t miss it! Yet another dramatic fire festival, this event is held on the evenings of 1-14 March, starting at times ranging from 6.30pm to 7.30pm, at Todai-ji Temple’s Nigatsu-do Hall (this is the hall that overlooks the plaza that is located east of the Daibutsu-den Hall). In this festival, the monks of the temple carry large flaming torches around the veranda of the hall and then wave them over the edge, raining embers down on the crowd below (it’s not quite as dangerous as it sounds). The most spectacular performance is held on the last evening, 14 March, starting at 6.30pm. By the way, the water-drawing ceremony, from which the event takes its name, is held later on in the evenings. Held at Kofuku-ji Temple on the third Friday and Saturday of May, this is a mystical performance of Japan’s ancient musical drama known as Noh. Illuminated by firelight, the effect is truly otherworldly. One-day tickets cost Y3500 and two-day tickets cost Y5000 and can be purchased at the tourist information centers in town. Performances start at around dusk. This event is held at the Roku-en deer enclosure, close to Kasuga-Taisha Shrine, on Sundays and holidays in the month of October. Here, those rascally deer from all over Nara-koen Park are rounded up and brought to the enclosure to have their antlers ritually sawn off. Naturally enough, the deer aren’t too happy about it, but if you’ve ever seen how aggressive they can be when you’re holding a packet of shika sembei (deer crackers), you’ll be glad that they aren’t sporting their full rack.